Tasty, but without too much of a bite, salsa verde is the salsa everybody will love. You'll be surprised at how fast and how simple it is to make. Use it in picadillas, enchiladas, tacos, tostadas and many more Mexican foods. Let's take a look at the ingredients. The base being the tomatillos, which have a much more vibrant flavor than the tomatoes of salsa roja. 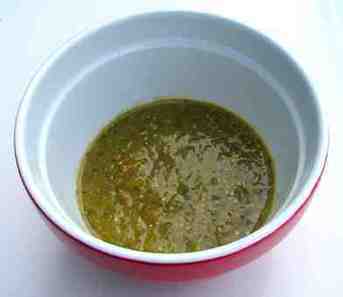 Of course being a green salsa we use green chiles and the cilantro so common in Mexican cooking. If you're using fresh tomatillas as in the photo above, you need to fry them (without oil) in a hot pan first. 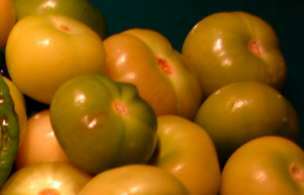 Canned tomatillos may be used as they are. Blend the garlic, chiles, and tomatillos together with a pinch of cilantro leaves and a teaspoon of salt in either a blender or food processor. How fast was that? Gorgeous, tasty, green salsa from scratch. Now you may use it as a dressing for all kinds of Mexican foods.